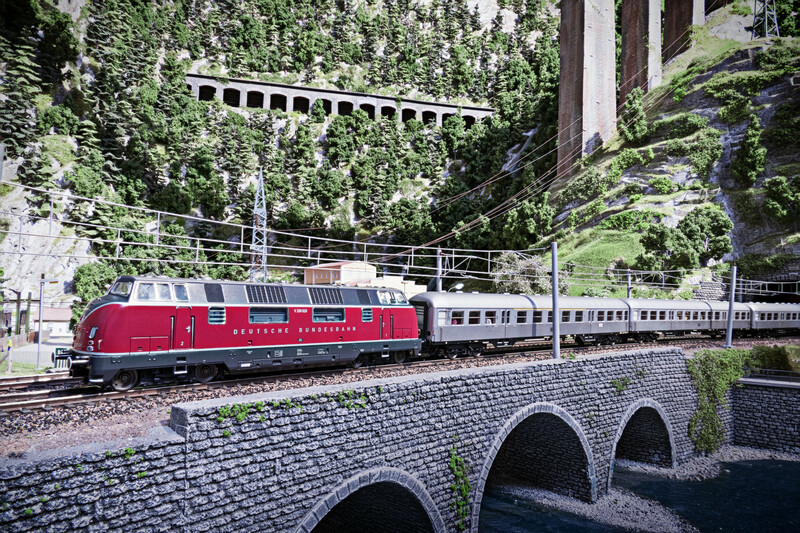 Since its opening in June 2015, the Hans-Peter Porsche TraumWerk has delighted its guests with a model railway of around 400 square meters in size, legendary vintage cars and a huge collection of rare toys. The TraumWerk resides in the upper Bavarian municipalities Anger/Aufham in the region Berchtesgadener Land. 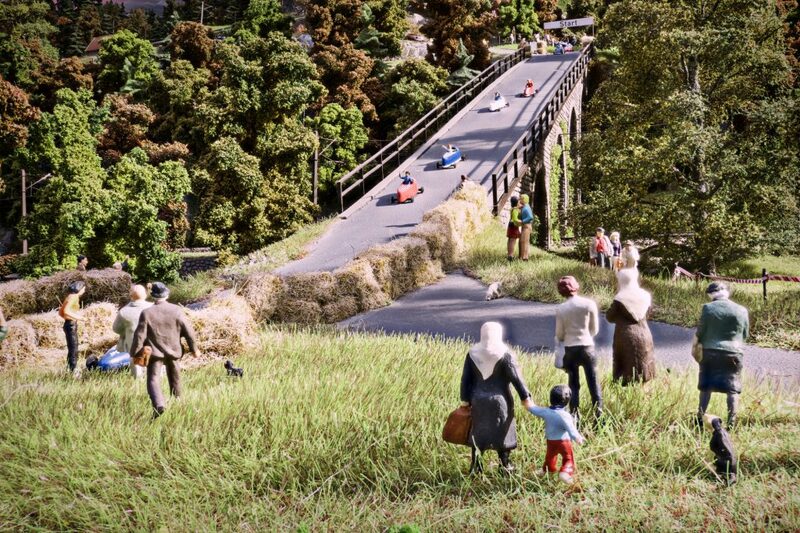 Here Hans-Peter Porsche, grandson of the legendary company founder Prof. Dr. H. c. Ferdinand Porsche, turned his long-cherished dream into reality with the TraumWerk museum. 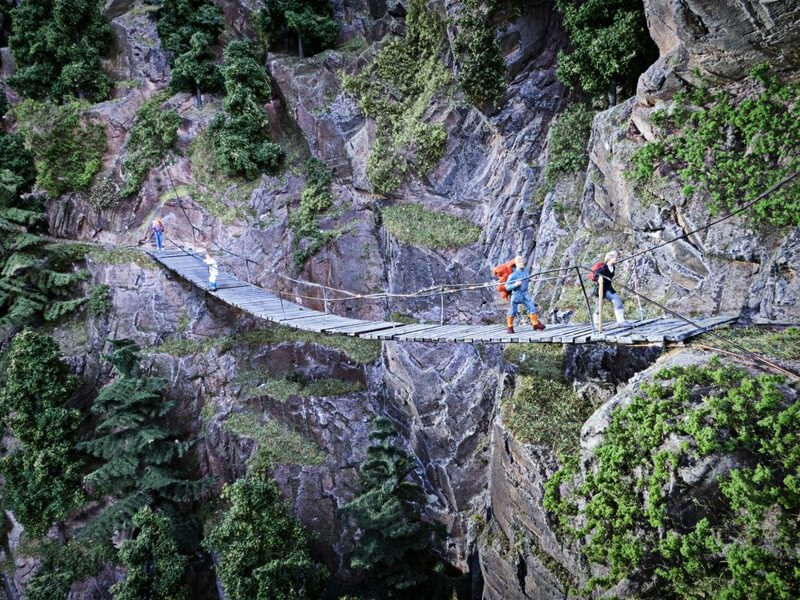 On a 55,000 square meters site conveniently located close to the motorway A8 not far from Salzburg, visitors experience a world-class collection. The museum is characterized by a modern, contemporary architecture that provides a beautiful setting for the treasures inside. Its core stylistic element is the building’s design in the form of a horizontally laid figure-eight reminiscent of the typical form of model railways and race circuits. Featuring such rarities as a Gauge 1 Marklin Krokodil and an array of Marklin ocean liners, the Hans-Peter Porsche collection ranks one of the best in the world. 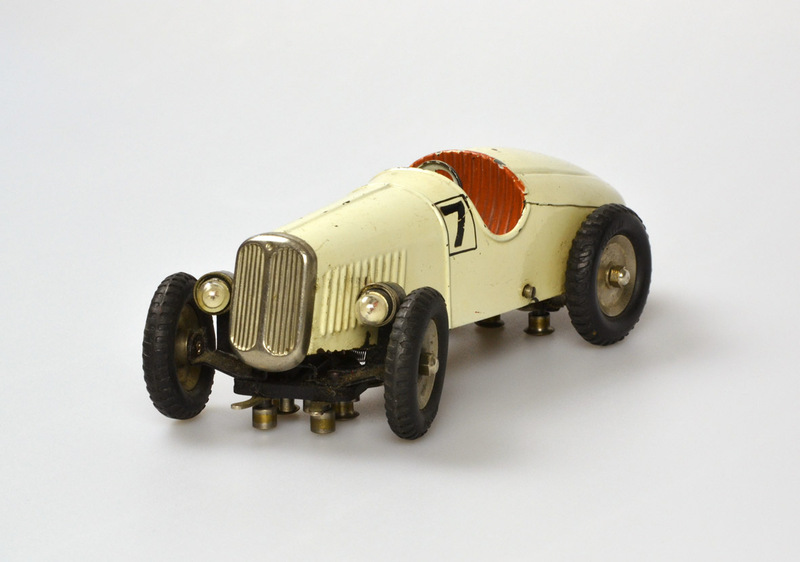 The museum captures some of the finest pieces from Marklin and other European tin toy manufactures. In viewing the pieces one can easily catch a glimpse of the quality and craftsmanship of such old toys. 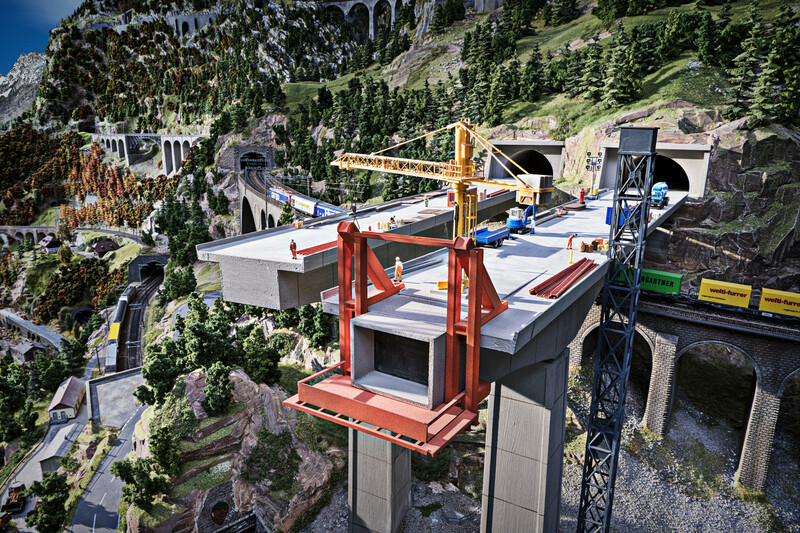 If a world-class toy collection isn’t enough, surely a seemingly never-ending miniature layout will fulfill any railway fan’s remaining desires. 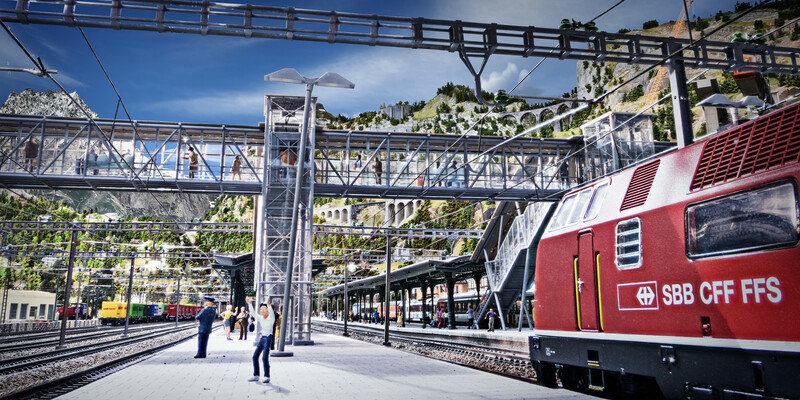 Detailed work from master modelers and special effects make the experience complete from miniature people to audio sounds to fill the surrounding landscapes. 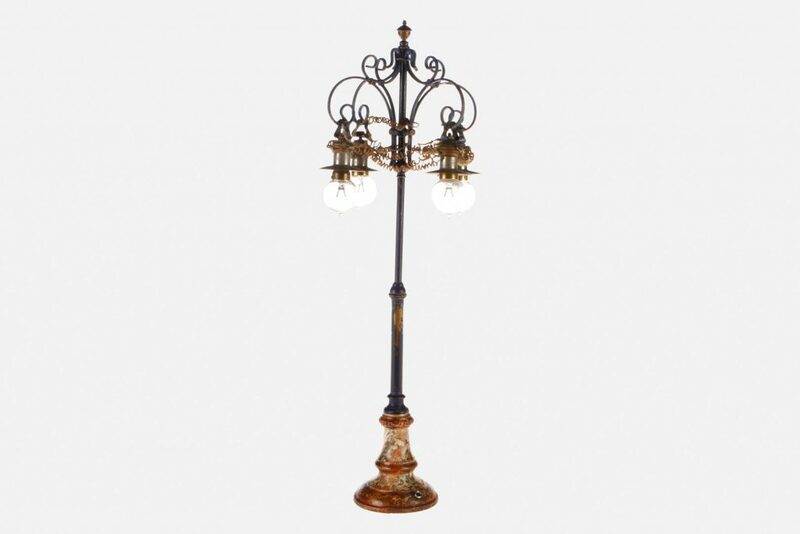 See an overview of the top highlights from the auction at Lankes’s website. 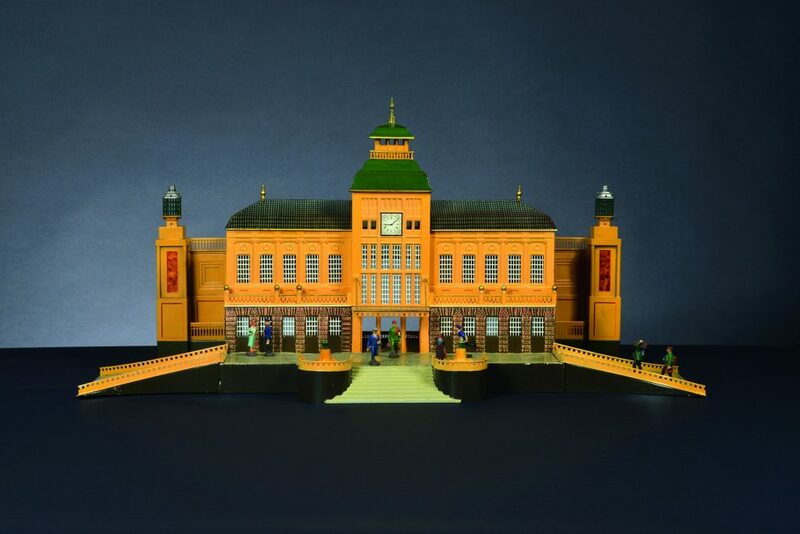 Marklin gauge 1 Leipzig Station 2037 BB complete with station accessories including 2 lamps, stairs, 4 halls, 4 lamps, and overhead pieces. 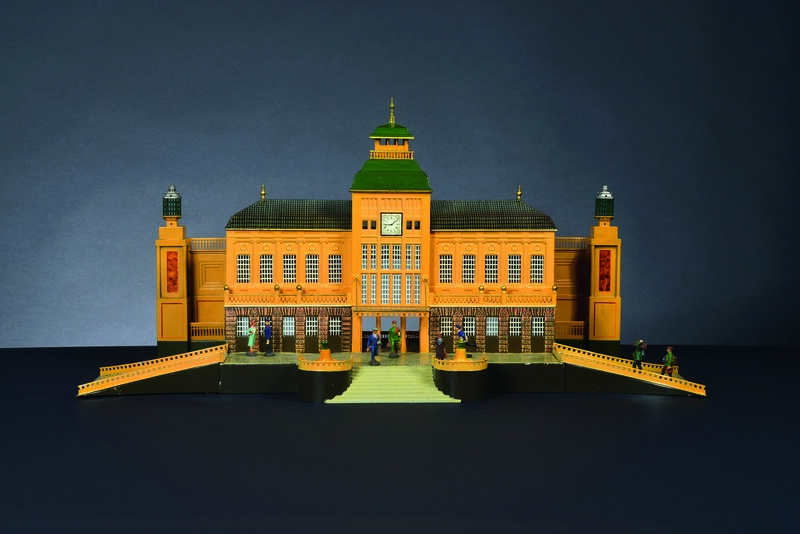 Impressive arrangement of an almost entirely complete Leipzig station from the 1930s! 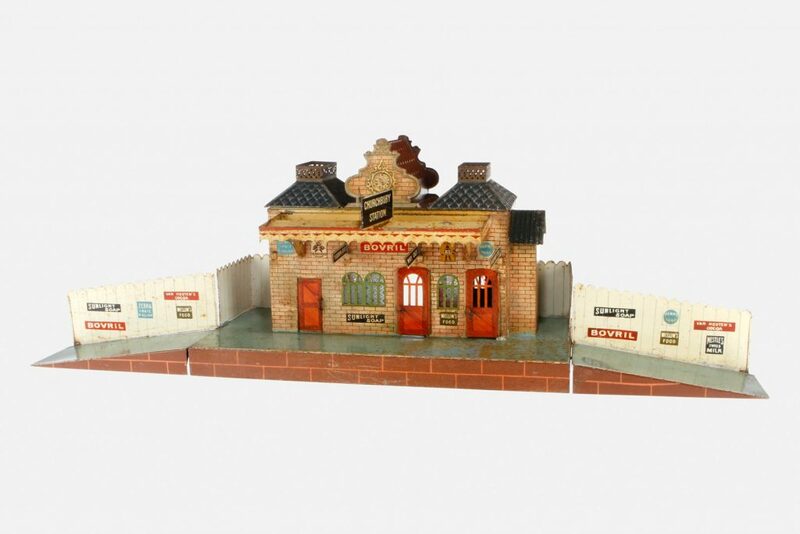 Marklin English “Churchbury Station” complete with signs and wall advertisements. 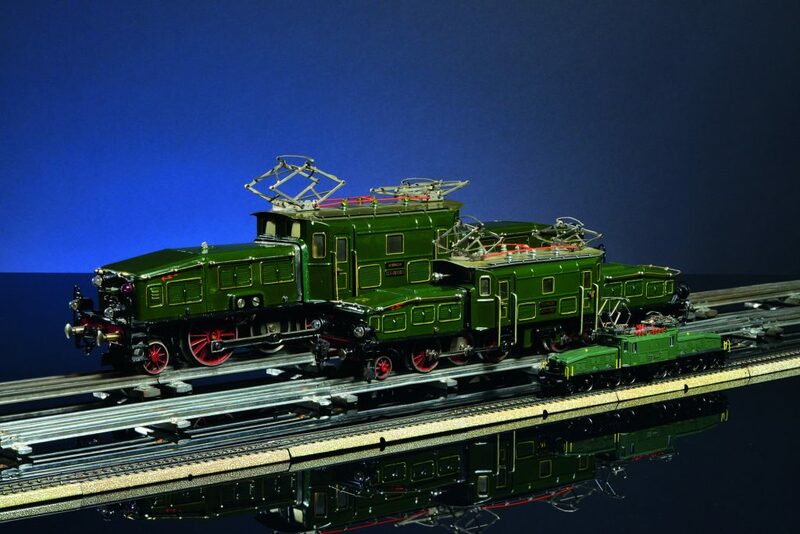 A Gauge 1 French PLM “Windcutter” locomotive. Interior view of one of the many coaches in a Gauge 1 “King Train” — notice the kitchen stove, seating area with tables, and small storage room with shelving. Engage your eyes with nautical treasures as we set sail on a journey through some of Marklin’s finest sea-fairing vessels. 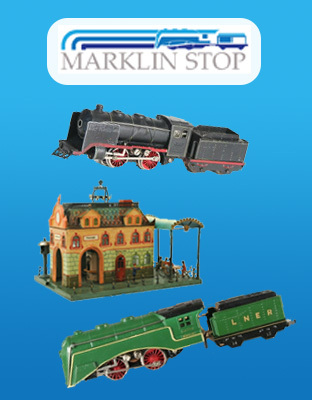 Around the turn of the last century Marklin began producing a wonderful array of tin boats and submarines. The broad range included early battleships with real cap-gun canons, steam paddle boats, large ocean liners with huge smoke stacks, and war-ready submarines. 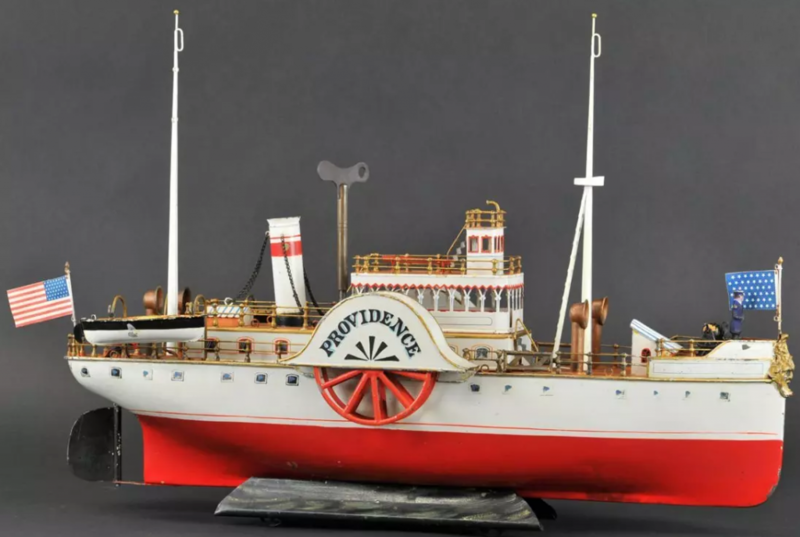 Whether powered by a clockwork motor, electric batteries, or a live steam plant, all vessels were built to handle real-life water excursions if their owners so desired and were brave enough to let their expensive toys set sail! 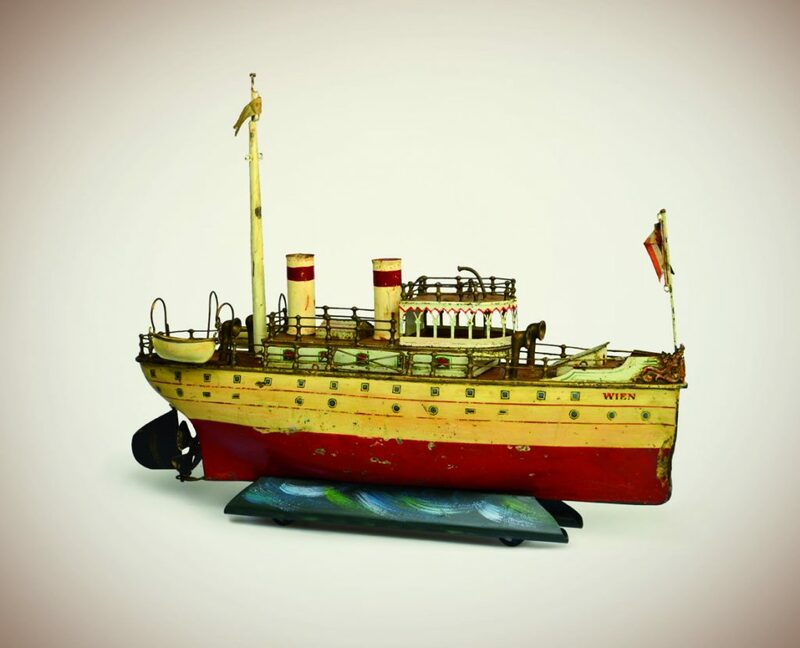 The majestic paddle boats have some of the earliest production dates (1900-1902) and most ornate detailing of all Marklin toy boats. Embodying luxury at sea, Marklin left no detail unnoticed and used artistic appointments like cabin windows, painted curtains and ornately stamped patterns for decoration. The upper levels often had passenger benches surrounded by gold-painted railing and staircases. Funnel were held steady by chains affixed to the deck. Lifeboats flanking each side of the vessel hung precariously on davits. The below example of a wonderful early paddle boat reads “PROVIDENCE” on the covered paddle wheels. Characterized by high mast towers and a pointy front hull ram, the Marklin first series battleships show both prominence and firepower. 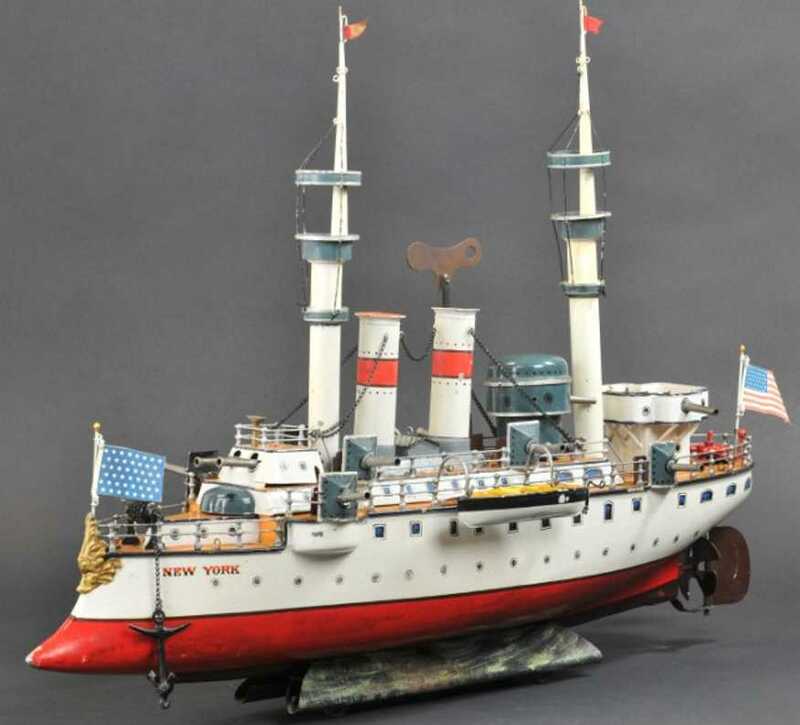 This particular “NEW YORK” boat below dates from about 1902 and features cannons at all sides, an upper level armored canon, and two masts with tiered observation platforms. 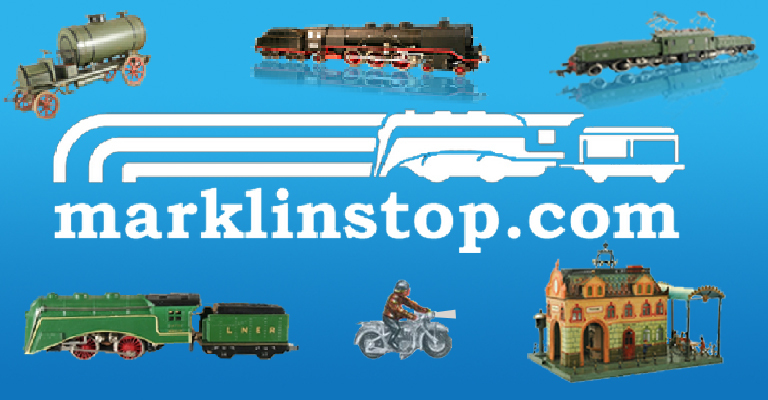 Ocean liners were arguably Marklin’s most impressive and were produced at the height of Marklin’s craftsmanship. The decks, finished in faux wood planking, were adorned with a host of elegant and intricate details including working anchors and chain, tall foremast fitted with searchlight and crow’s nest set just before a multi-tiered superstructure, captain’s quarters and large smoke stacks. 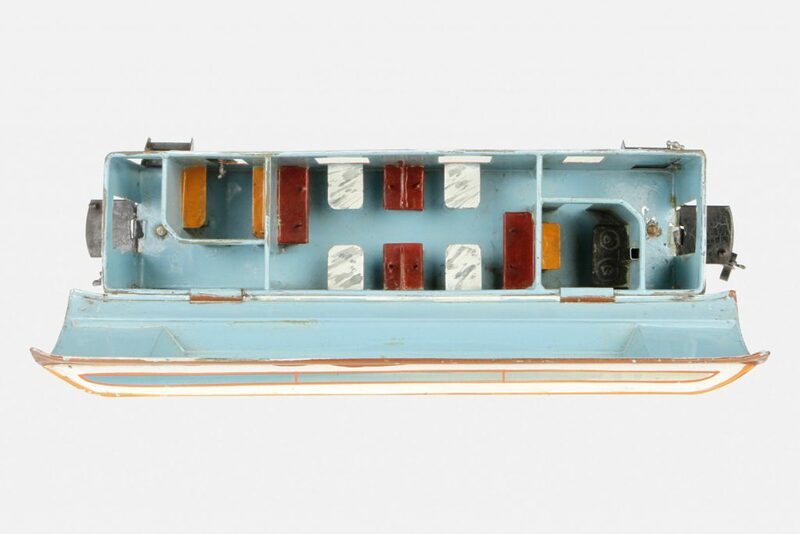 At the rear of the ship a domed panel skylight, and ship’s wheel which mechanically controls the rudder bearing Marklin’s crest logo. Electric (dry cell) batteries power an electric motor housed in the hull which propel two propellers via long drive-shafts. 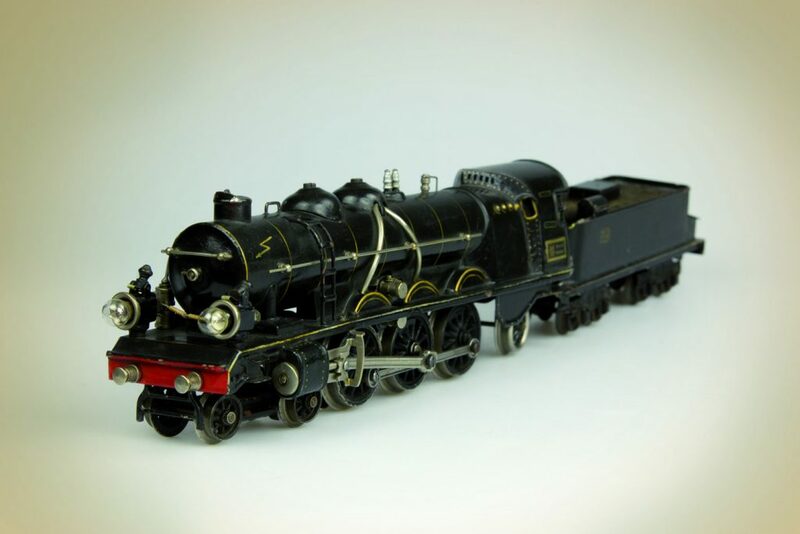 Other models are powered by clockwork or even a live operating steam plant. 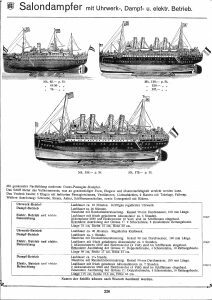 The page above from Marklin’s 1909 product catalog describes the three most popular ocean liners. 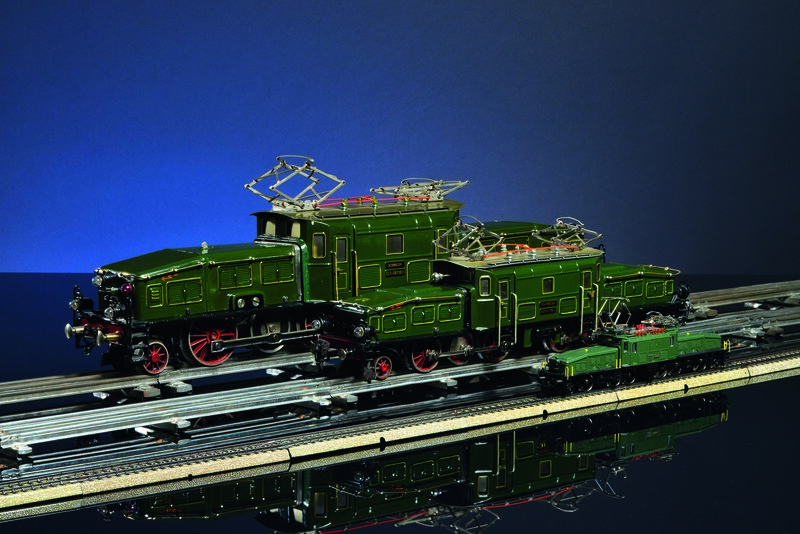 Some are “clockwork operation” ships while others are steam or electric (with lights!). They can run in the water for 12 minutes (clockwork) or from 25 minutes to 1.25 hours (steam). The electric ones can run from 5 to 7 hours. The three sizes include 71cm (28 inches), 100cm which is about 39 inches and the largest at 1.2m which is over 47 inches long! 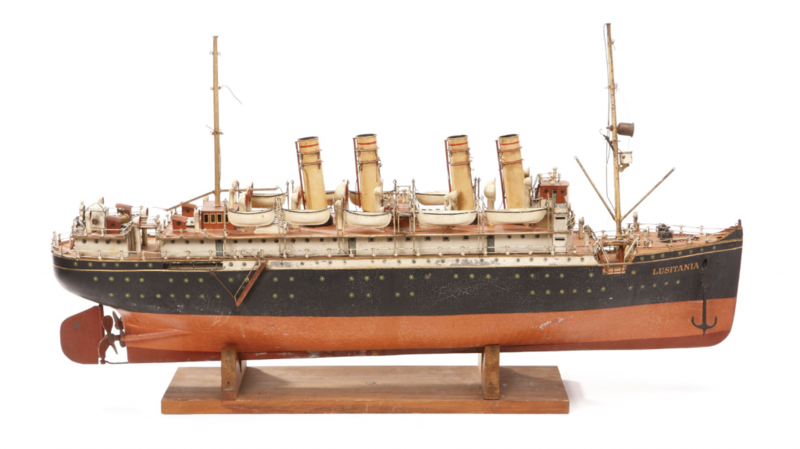 An exceedingly rare example of the mid-sized ship is the “LUSITANIA” variant, sold from the Malcom Forbes Toy Collection by Sotheby’s. 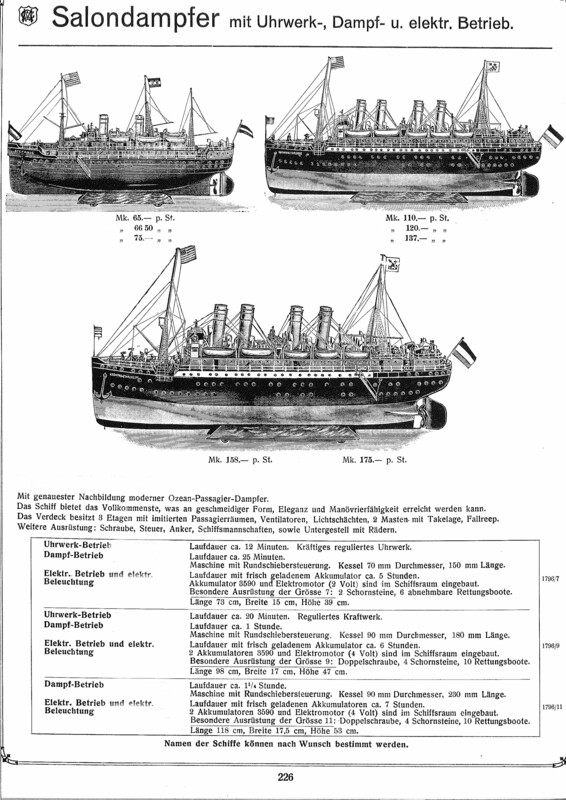 This is the only known example of this model bearing the Lusitania ship name. 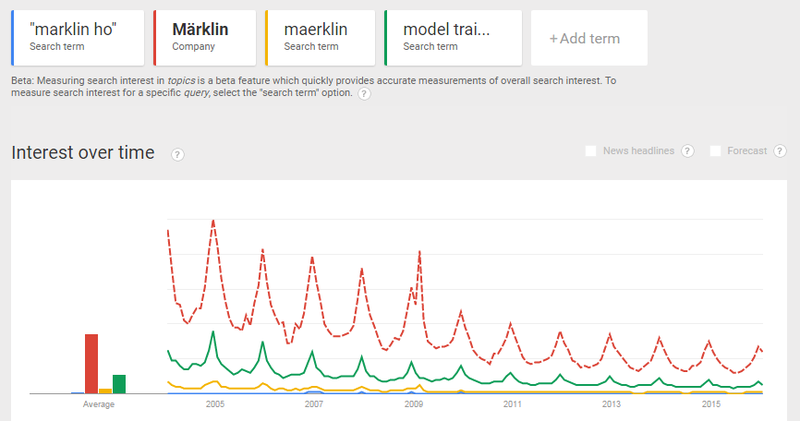 As submarines appeared in naval fleets, Marklin followed suit producing its own range of realistic military vessels. Appropriately finished in military green, these submarines present a sleek yet threatening stance. 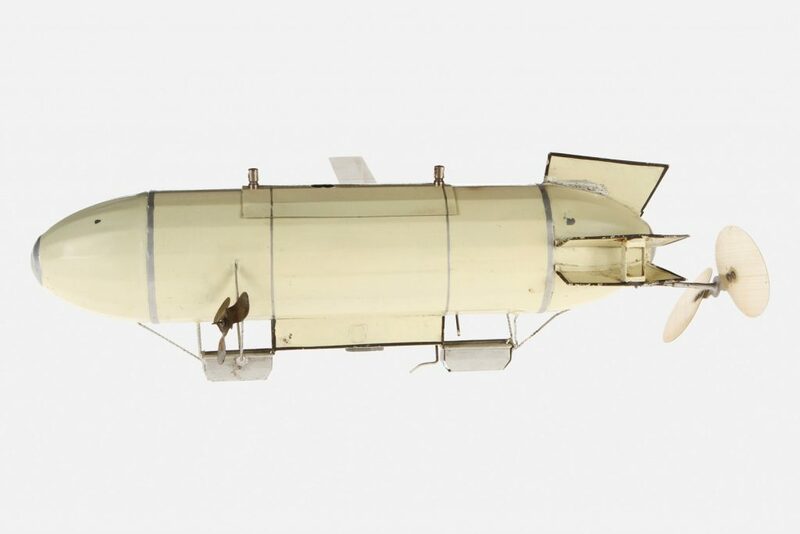 The clockwork mechanism, accessed through an airtight hatch, turns a single propeller and four hull-mounted diving planes. Embellishments such as torpedo bursts, portholes, and anchors bring wonderful realism to the vessel which sits on a wheeled stand painted with wave-like brushstrokes and coloring. Bertoia Auctions has announced it will sell the incredible Jerry Greene collection in a multi-part sale. Michael Bertoia stated “Because it is so vast, we really can’t estimate how many auctions will be required to sell it all.” The collection is truly incredible with some one-of-a-kind pieces from makers like Marklin, Bing, and Lutz. 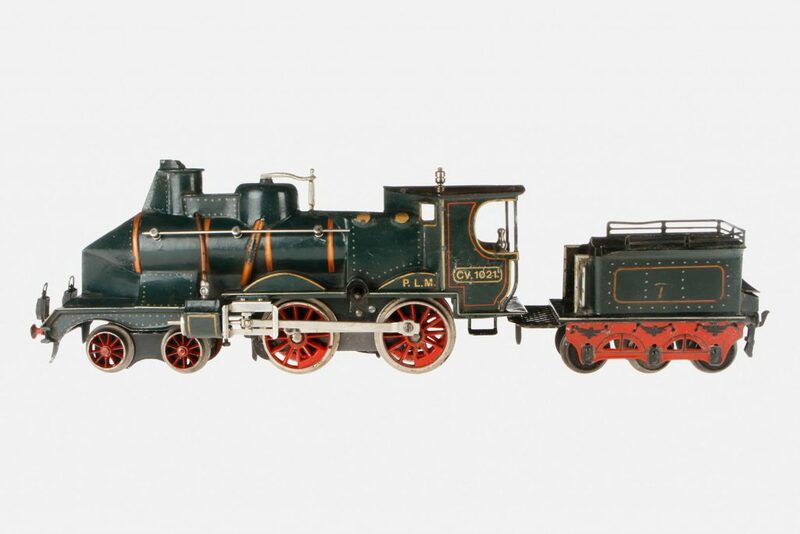 The couple’s trains, which were purchased over several decades from a variety of sources both in the United States and abroad, have been divided into approximately 700 auction lots. There are European and American train cars, coaches and specialty cars; train stations, specialty train sets in O, 1 and (Bing) 3 gauge. 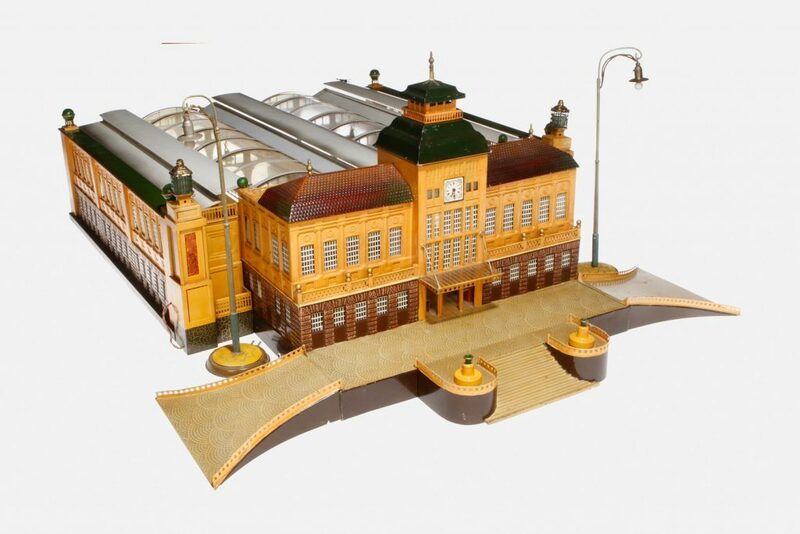 The European train accessories section comprises a virtual auction unto itself. According to Bertoia Auctions, the private collection of Jerry and Nina Greene, which Bertoia’s will auction on April 9, 2016, is in no way associated with the Jerni Collection. They are two separate and unrelated entities. Some might remember that a collection was offered through Sotheby’s several years ago in a private sale format instead of an auction. Members of the collecting community placed guesses on the total collection value, with some estimates reaching up to $50m. Although some serious offers were placed on the collection, it was not ultimately sold. 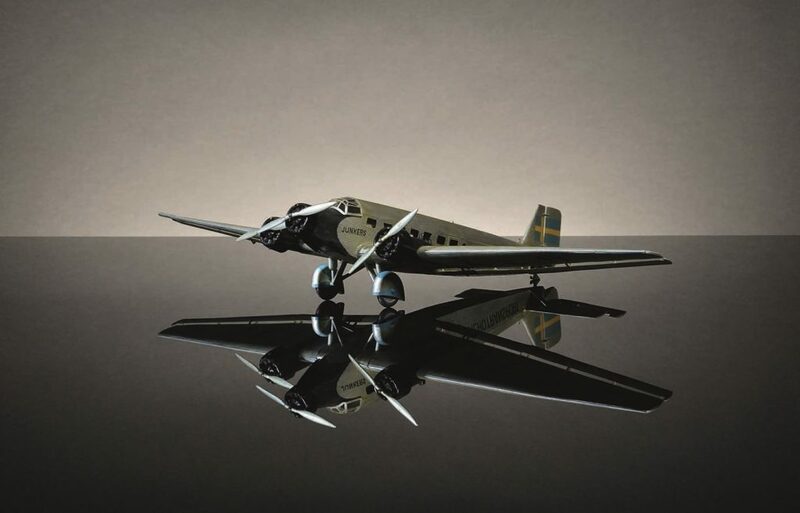 Some pieces then went on display at the New York Historical Society and the collection was prepared to sell at Lankes Auktionshaus in Germany. 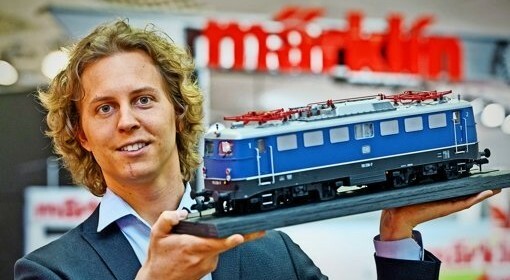 Rumors circulated that this auction fell through because of the high taxes the seller would have to pay upon importing and selling the trains in Europe. In addition to the fluctuating exchange rates between the Dollar and the Euro there are a number of financial risks with selling the collection abroad. The Greene family’s decision to place the collection in the hands of Bertoia Auctions seems like a wise decision given the auction house is located nearby in New Jersey. Bertoia Auctions has established a fairly solid reputation for itself in high-class toys with several impressive auctions each year.